A few days ago, WP Tavern reported on SIDEKICK’s decision to delay their Composer product. In the second half of the article, Jeff Chandler asks “where is the happy medium?” when it comes to shipping things. Shipping is an art; a skill you acquire after practicing it over and over. Good “shipping senses” come with familiarity. 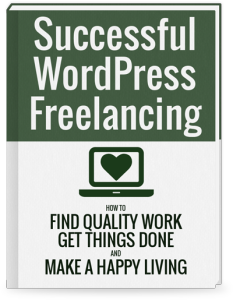 As you get familiar with a particular task (WordPress development, Photoshop, writing short stories, etc.) it gets easier to predict when you’ll be done, and when you’ll ship. It’s not so scary when you’ve done it before. You’re probably pretty good at shipping something: code, designs, market analysis. But what happens when you try something new? If you’re like me, unfamiliar tasks rekindle the fear of shipping. Recently, I picked up a new hobby: Writing. You’re reading my latest shipment! Shipping this blog was hard. The “Publish” button kept eluding me. I made rewrite after rewrite, trying to clarify what I’m saying. I don’t know what good writing “feels” like. Suddenly, the fear of the unknown paralyzes me. There’s always one more topic I should cover, one more editing pass I can make, or one more copywriting improvement before I let anyone read what I’ve written. Think back to the last time you picked up a new skill, tool, or hobby. Maybe you started work in a new programming language or you tried a new design methodology. Something you had zero experience with to start. Was it easy to ship something? Did you feel the urge to return to the familiar? It gets more complicated when you’re being paid to do something new. How can you know when it’s “done” if you’ve never “done” it yourself? In these situations, you need to err on the side of shipping. You need to choose a direction ASAP – but you’re not qualified to choose that direction yet. Let someone else see your work in a rough state. Sometimes, that’s the client. Sometimes, a coworker or colleague. I finally realized I’m never going to be satisfied with my writing. It’s time to put it out there. Who cares if I’m a good or bad writer? I’ll figure out if I should continue this writing thing. I’ll figure it all out once I ship something. Until then, I’m just paralyzed by fear of failure. Of wasted time. No more waiting. It’s time to ship it!